The Siren of Canal de los Barcos, the Curse of the Gypsy, the Guasa of the Pontoon, the Light of San Telmo, the Treasure of Cayo Santa María, the legend of the White Pirate Ship, the story of the Sea Horses, the Treasure of Cayo Verde, the Treasure of Cayo Frances, the Treasure of Cayo Fragoso, the Treasure Hunter of Cayo Viejo and the Secrets of Cayo Maja. 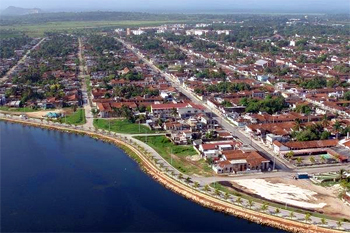 The seaside village located 10 km west of Remedios along the coast. 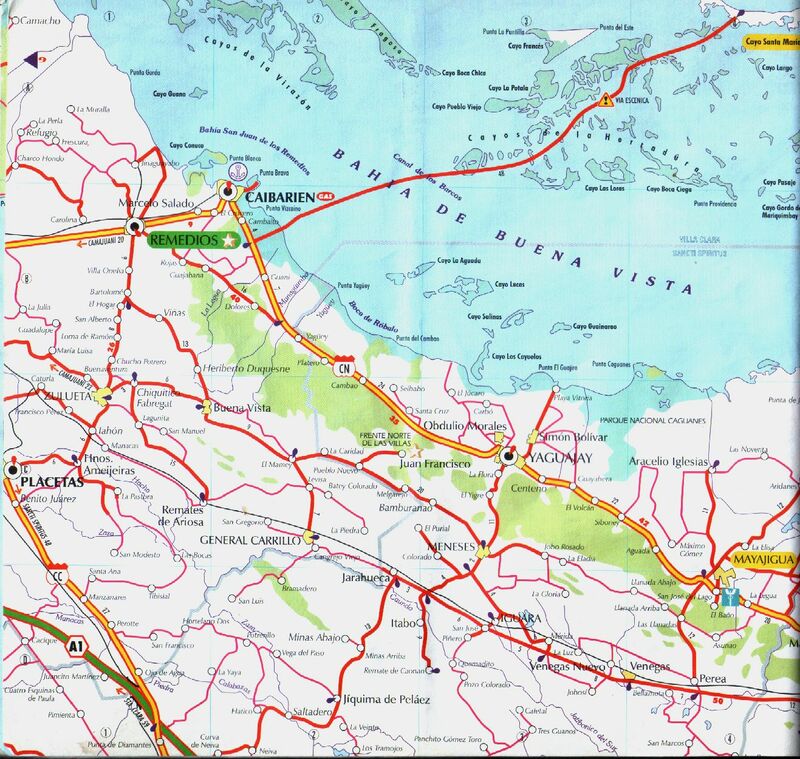 Access point la Cayeria del Norte, a string of cayos or keys : Conuco, Largo, Las Brujas, Santa Maria and others, by way of a 48 km long causeway (pedraplen), linked by some 35 bridges. An engineering feat. Access fare is 2cuc each way. Noteworthy : at one end of the Malecon (palm trees at right), one can find the Cuban national sailing school installations which are very popular for laser-type sailboats and windsurfing courses. The town and its casas is an affordable alternative to travellers with a car who would rather stay with Cubans and enjoy the cayos and their beaches on a daily basis rather than pay the high all-inclusive rates in the cayo resorts. 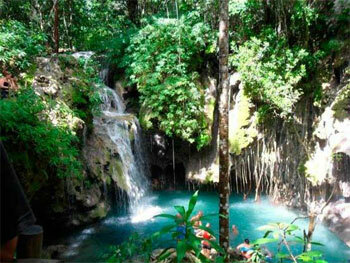 Even if it means an 80 km (50 miles) return trip every day to the cayos. 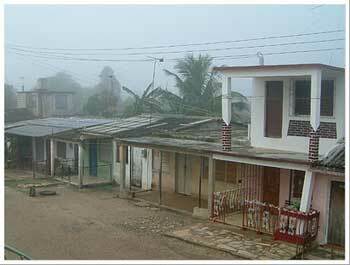 "There is much to see and like in this little town but unlike Remedios, it has not been well maintained. Still there is a charm about this coastal fishing town. Seafood is fresh and easy to find. • Museo María Escobar Laredo where is stored the impressive collection of photos on glass plates taken by Martínez Otero  this is the most important collection of its kind in Latin America, located in the impressively renovated Liceo edificio on Parque central • Galería de Arte Leopoldo Romañach Guillén in town centre • Galería de Arte Leopoldo Romañach with Trova singers and musicians each month • Banda Municipal de Conciertos  chorus and orchestra founded in 1904 • Tienda Artex Aurora, on avenida 9 #1804 for "chopping"
Drive on the scenic route from here to Yaguajay (via Remedios), the north coast town - site of the Museo Camilo Cienfuegos. 100 bucolic k's there and back. Some 30-50 km north of here : Playa Ensenachos, Playa Las Brujas (best : see caption at right), Playa Las Salinas, Playa Santa Maria and, at the very end of Cayo Santa Maria, without any shade whatsoever : Playa Perla Blanca. 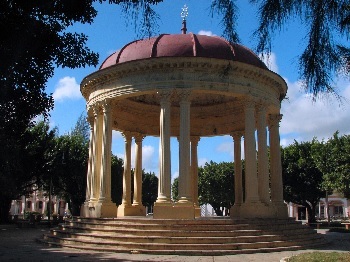 La Vicaria on Plaza Central. 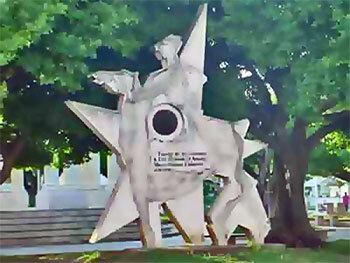 Cafeteria La Cubanita. At Hotel Central, try the local specialty, Salsa Perro, a cross between bouillabaise and ceviche. 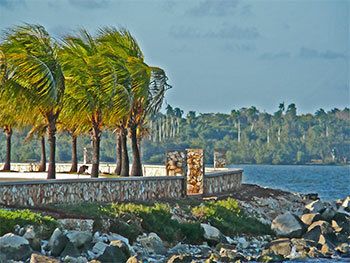 About halfway to Remedios, in the Reforma burrough, visitors may enjoy the old sugar mill turned museum. 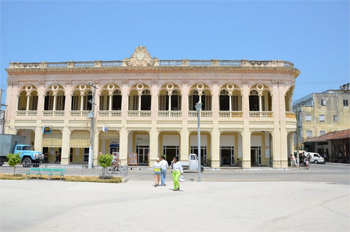 Called Marcelo Salado : repainted, rejuvenated and remarkable with some 20 old steam belles (locomotivas) in this, the very first Museo de la agroindustria azucarera ("Agro-sugar industry museum") in Cuba. • Facing Cayo Frances, the Buque San Pascual (S.S. San Pasqual) this civil engineering rarity is a ship built in San Diego in 1920 was part of the emergency fleet of the US and has been left there since 1933 • Fuerte Reparto La Torre. The fort protected in the 1890's the Zulueta train line • The old Dolores sugar mill named Antiguo Ingenio de Dolores : its modern-like tower resembles that of the Manaca Iznaga near Trinidad • Ride the scenic and quasi-deserted East-West road parallel to the main trans-island highway to the town of Yaguajay, site of Museo Camilo Cienfuegos : about 100 bucolic kilometers round trip. Local busses 4x day to Remedios, and from there, 5x day to Santa Clara; taxis to the cayos on a (wait for you all-day basis or come back at such-a-time basis or the leave-us-here-we'll-pick-up-the-employees-only-bus-and-bribe-the-driver : not! basis). 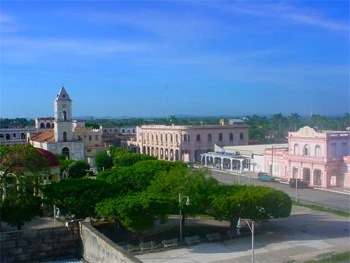 The exhuberant fiestas involving competitions between barrios with fireworks and costumed parades take place every year all over Villa Clara province, mostly in winter. Here's the list : Taguayabón on the 27th of Nov. (barrio El Gallo vs barrio el Gavilán) then others in December : Caibarién (La Loma vs La Marina), Remedios (El Carmen vs San Salvador), Crecencio Valdés (El Toro vs el Caballo), Muelas quietas (La Loma vs la Marina), Placetas (Zaza vs Fortun), Carrillo (La Fama vs El Mango), Remate de Ariosa (La Loma vs La Marina), Calabazar de Sagua (Sapos vs Chivos), Sagua la Chica (La Loma y La Marina), Cótica (El Tiburón vs el Manatí), El Santo (Carraguao vs Pavo Real), Quemado de Güines (La Puya vs el Perejil) all on Xmas Eve and in Zuluetas on the 31st (Guanijibe vs La Loma). 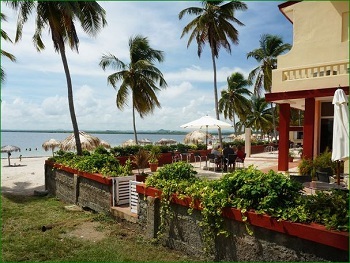 The low-budget hotel chain Islazul offers 17 bedrooms for about 22cuc per person : Complejo Brisas del Mar beachside [link]; restaurant not worth it but bar-restaurant next door has good fare and may eventually offer rooms. The 50 km (30-mile) El Pedraplén causeway cuts through Buena Vista Bay to the Cayeria del Norte cays © Unseen Cuba / Marius Jovaisa. Click for more unique aerial views. 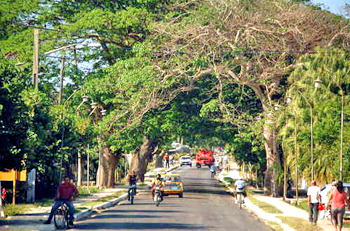 The very popular Circuito Norte bus circuit which originated daily in Trinidad and went through Cienfuegos, Santa Clara, Camajuani, Remedios, then Caibarien (passing here at 11:45 am) has been restaured, because houseowners and travellers complained so much when it was cancelled in October 2013. 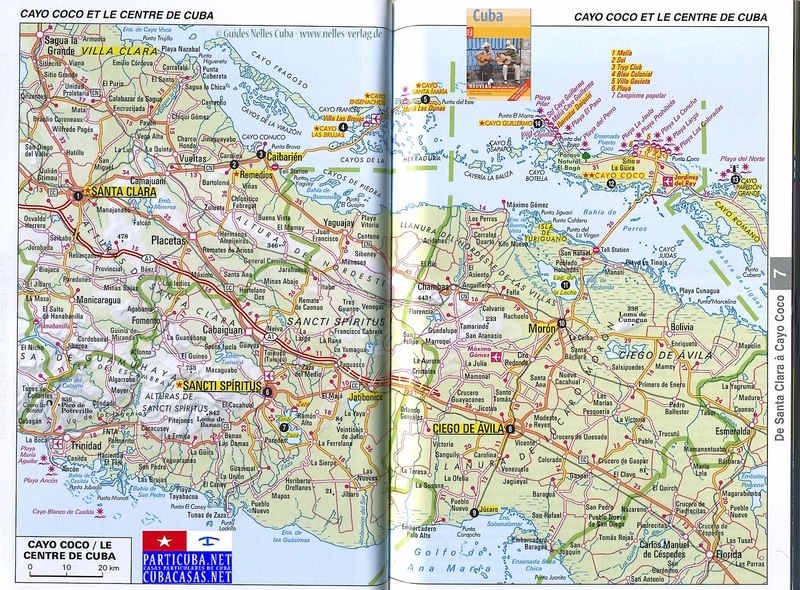 • From Canada and the USA : 011 53 (add phone # preceded by 42 for Caibarien) • From Europe, Great Britain, Scandinavia and Mexico : 00 53 (add phone # preceded by 42 for Caibarien) HOW TO DIAL A CUBAN PHONE NUMBER HERE ••• CELL PHONE NUMBERS on our town lists and casa pages are preceded by 05 for calls originating Havana; from anywhere else in Cuba, dial 01 + the 8 digits of the cell. 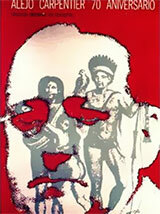 Click mini photo to enter casa's page. 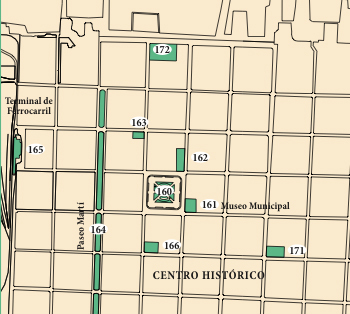 See a city street plan here.